Over a decade of rigorous clinical studies in Europe and elsewhere have established SAM-e (S-adenosyl-L-methionine, an essential methylation and transulfuration cofactor) as a useful tool for supporting normal mood regulation, and joint and liver health. SAM-e increases cell membrane fluidity, up-regulates neurotransmitter receptor number, and enhances neurotransmitter receptor affinity. SAM-e supports healthy joints both by increasing the number of articular chondrocytes, and by stimulating the synthesis of protective sulfated proteoglycans therein. SAM-e also protects synovial cells against pro-inflammatory prostanoids, and blocks enzymes that degrade cartilage. SAM-e is a precursor of the critical antioxidant glutathione, a key molecule in the detoxification process in the liver. SAM-e Plus contains the tosylate form of SAM-e as used extensively in clinical trials, and includes several other ingredients found in studies to support and facilitate these functions. SAM-e Plus tablets are enterically-coated, essential for preventing demethylation in the stomach. S-Adenosyl-L-Methionine (SAM-e) supports normal liver function by acting as a methyl donor, and by promoting the regeneration of sulfur-containing amino acids and glutathione which protect against oxidative stress and toxic substances (Aliment Pharmacol Ther 1993;7:21-8). SAM-e promotes the health of joints by stimulating the synthesis of proteoglycans in articular chondrocytes; SAM-e acts with minimal or no side effects on the gastrointestinal tract and other organs (Am J Med 1987;83:60-5). SAM-e is a major source of methyl groups in the brain, and promotes normal mood regulation (Acta Neurol Scand Suppl 1994;154:7-14). 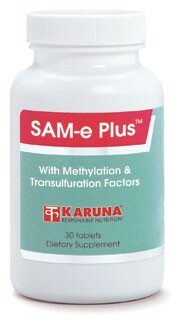 SAM-e Plus tablets are enterically coated, which is essential since oral SAM-e is largely demethylated in the stomach, thereby losing much of its unique character. SAM-e Plus includes additional nutrient factors essential for normal methylation functions (Proc Nutr Soc 1999;58:441-8, Am J Clin Nutr 1995;61:659S-665S). Suggested use for adults: Two to four tablets daily, preferably morning and evening, or as directed.